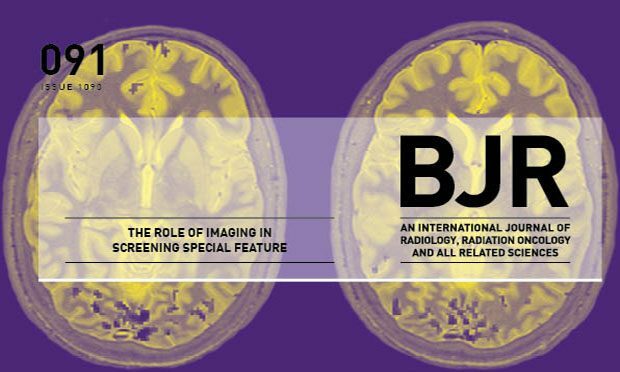 The British Journal of Radiology (BJR) has published a collection of articles covering the role of imaging in screening. Imaging is the way diseases are found and treated and the pieces will be of interest to health professionals including nurses, physicians, screening programme managers, radiologists, radiographers and physicists. Here is a taster of the articles you can read and links to take you to each one. Professor Bob Steele, Chair of the UK National Screening Committee, takes a look at what needs to be in place before a screening programme can be set up. There would be advantages to having a central storage of images, but how could this work in practice and what are the challenges? Security, workflow and logistics are explored in an article by Tessa S Cook. Screening involves the consent of the patient, but how do we communicate openly and effectively with patients when things go wrong? This article explores the principles of duty of candour and cancer screening. There are several other pieces on various topics, including breast and abdominal aortic aneurysm (AAA) screening. Carotid artery stenosis screening: where are we now? The articles are behind a paywall as BJR is a subscription journal. However, the publisher has provided free access to our readers using an access token. First you need to register on the BIR Publications website. Click on the link in the verification email you will receive. Enter the code SCREENING2018 in the access code box. Once you've done this, click on the correct issue. This will enable you to read the articles. More information is available for subscribers and non-subscribers. This is an informative and thought-provoking collection of articles and I encourage everyone with an interest in screening and surveillance to check them out. Did you miss any screening blogs in November 2018?